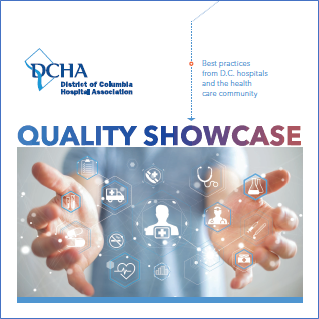 2018 marks 40 years of the District of Columbia Hospital Association’s (DCHA) collaboration with members on important issues facing D.C. hospitals and the community. This past year, D.C. hospitals adopted a resolution of commitment to foster a culture of quality and patient safety that drives positive health outcomes for patients, staff and the community. We at DCHA are proud to be involved in facilitating collaborative actions and convening community stakeholders to drive improvement across the District of Columbia and the region. We celebrate the work of our members and the broader D.C. health care community in improving patient safety and health care quality through innovative practices that disrupt the status quo. The works and successes presented in this publication represent the dedication of D.C. health care leaders to continuously strive toward better care, better experiences, and better outcomes for those we serve.